Seven nursing students, who are this year’s participants in the TOMODACHI J&J Disaster Nursing Training Program, took part in the Pre-Trip Seminars held in Sendai, Miyagi Prefecture from July 9 to 10 and July 21 to 22. The goal of the Pre-Trip Seminars is to bring together the participants and various shareholders prior to the U.S. Study Tour to be held in August, and to deepen the sense of purpose and learning of the program. The first Pre-Trip Seminar included an overview of the program and various assignments, and identified what the students want to gain and accomplish through the program. Moreover, Misa Abe and Mika Sato, who are members of the third year cohort of the program, shared their accomplishments and lessons from the program. Furthermore, Mr. Shinichi Egawa, of the International Cooperation for Disaster Medicine of Tohoku University, gave a lecture on “Disaster Medicine and Nursing.” Upon finishing the lecture, the participants reflected on the fact that despite having studied this field in school, it was very valuable to listen to experts, making them realize that there is much more depth to the knowledge and experience that they can gain. The participants then visited Minamisanriku City in Miyagi Prefecture, and Okawa Elementary School, which became a vacant lot after the destruction of Great East Japan Earthquake and Tsunami. 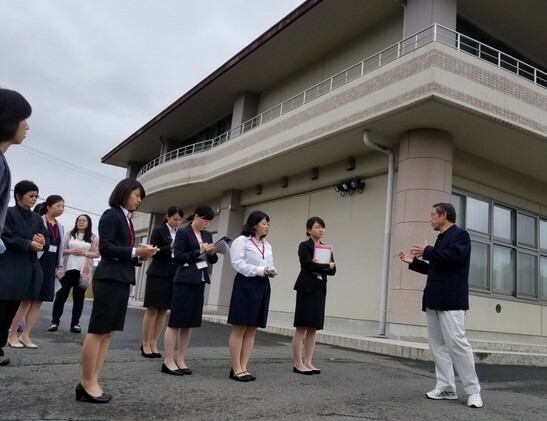 In Minamisanriku City, Mr. Seietsu Sato, who was the deputy fire chief of the Minamisanriku Fire Department at the time of the disaster, gave a talk on disaster medicine and nursing while integrating his own experiences, using photos and video. At Okawa Elementary School, the students heard from Mr. Toshiro Sato, who lost a family member in the tsunami. It enabled the students to learn the atmosphere at the time of the disaster, which is impossible to portray through media. The participants carefully listened to the stories of the two speakers, sometimes holding back tears. These site visits not only allowed everyone to gain the same understanding of and sentiments towards the Great East Japan Earthquake, but also enabled the students’ deeper contemplation on the impact of an individual, and what type of a nurse or medical professional they aspire to become. The second Pre-Trip Seminar was conducted with Mr. Kenta Umetsu and Ms. Emily Dorosz from the Children’s National Health System, which implements the U.S. Study Tour portion of the program. Moreover, following the first Pre-Trip Seminar, the students practiced the speeches they will present in the United States. On the first day, many students were nervous and anxious, and were frustrated by their preformances. Through feedback and restructuring the speeches, the practice presentations again gave the students an opportunity to consider the importance and challenges of delivering a message, as well as to identify their most crucial takeaway. 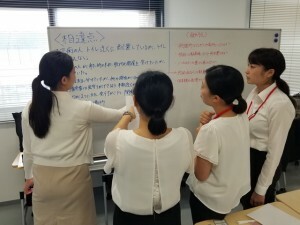 Moreover, during the second Pre-Trip Seminar, Ms. Miki Kosaka of Iwate Medical University, who participated in the program last year as a mentor, conducted a HUG workshop (HUG stands for Hinanjo Unei Game, meaning Evacuation Center Management Game). She is also a member of the Disaster Medical Assistance Team (DMAT). 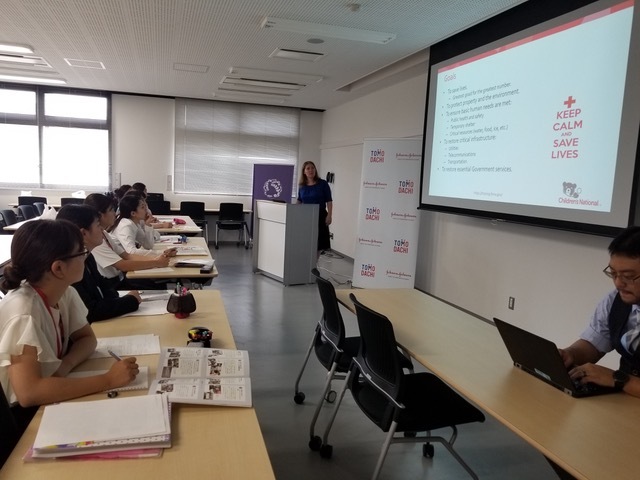 The students were able to learn specifics of the current Medical and Nursing field, and the disaster response system in Japan. It was very valuable to hear first-hand from a member of DMAT. Lastly, at the second Pre-Trip Seminar, alumni from the program’s third year, Kaoru Omiya, Mika Sato, and Tomoka Yamaguchi, spoke about the activities they have done upon returning from the US Study Tour. They offered tips on how to plan and shared their accomplishments to date, as well as what they learned from their experiences. Finally, the alumni sent hearty cheers to the new cohort.